Girl chases boy, boy chases girl. Obviously different boys or else this would be too easy. Love triangle please! Original run: Oct 1, 2014 – ??? Set against the backdrop of Han Dynasty, a girl from the desert, adopted by Han Chinese, comes to the capital city to seek her fortune. She meets two men who help shape her life, and she is destined to be with one of them. Through the struggles of politics, power and money, which one will she end up with? There’s always something delicious about a mysterious man of honor, so gentle and kind that you wonder hey do you have a motive or something? But no, he is just sweet and loving, so sweet and oh so loving that you forgive him for having the smallest “imperfection” such as being in a wheelchair. So sweet and SO loving that you almost think his wheelchair is hot. And then there’s the bad boy who rides the original ferrari (read: horse). He is neither gentle nor is he sweet, but he certainly respects and admires you as an equal. Oh, and not to mention he comes from an affluent family composed of an aunt who is the queen, another who is the princess and an uncle who is the king’s favorite general. And this bad boy himself is also a hot shot destined for all kinds of glory. 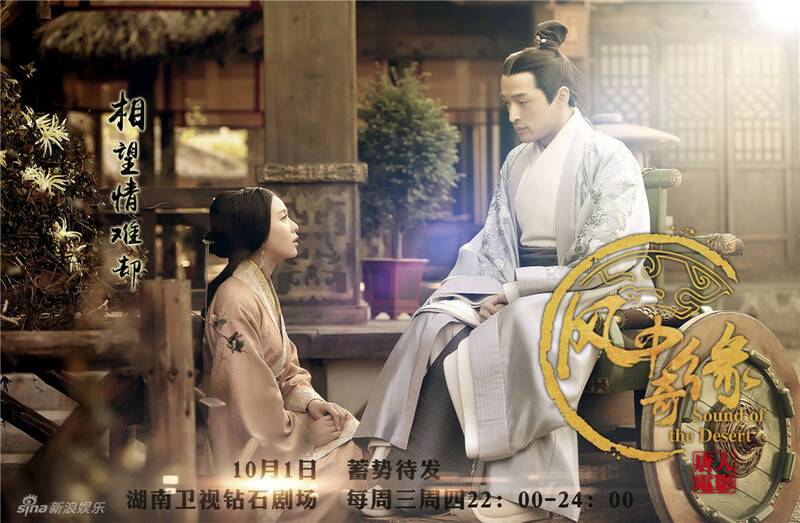 Xin Yue is certainly lucky to be adored by two such fine men, but if you know anything about the author (Tong Hua) who wrote the book the show is based on, then you can pretty much guess the ending. It comes to me as no surprise that the story has played out the way it has so far, but I’m glad Xin Yue is a strong woman who has ambitions and goals, one who is not just stuck prepping teas and pastries as a pastime. I’m excited to see how Cecilia Liu fairs in this series post her breakout role as Ruo Xi in Bu Bu Jing Xin (also written by Tong Hua). I think she is a pretty solid actress and although she is no knockout beauty she has a very clean and 耐看 (features that do not get tiresome with time) face. Some of her acting and patterns of speech in this reminds me of Ruo Xi, but that might not be her fault, and may merely be the product of the author’s writing. Hu Ge is a well established actor and carries Mo Dun, the chair bound man of mystery quite well. His movements are largely limited by his wheelchair but he does not pale in comparison to anyone else on screen. Eddie Peng, on the other hand, is new to me. I have seen his name show up here and there but I don’t think he has been in any huge productions in the past, or maybe I have just been living under a rock. In any case, he has been fairly stable so far and seems to promise a lot more later on. The plotline is old and the characterizations are tried, but for some reason love triangles always capture the hearts of millions, mine included. While loving the second lead I will always fall for the main character. So who will it be, Xin Yue? Pssst. it looks like we won’t be recapping this drama any time soon, but if you are in the market for a new series, be sure to check out Love is Back/Ai Qing Hui Lai Le which already have recaps up!